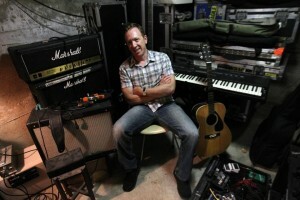 For a guy who has dubbed himself “Part-Time Man of Rock” Bill Janovitz is awfully busy. On Thursday he will celebrate the release of his superb new solo album, “Walt Whitman Mall,” with a show at the Lizard Lounge. On Saturday the band he’s fronted for more than 25 years, Buffalo Tom, plays for free on Boston Common as part of the Outside the Box Festival. And on July 23, St. Martin’s Press will release “Rocks Off: 50 Tracks That Tell the Story of the Rolling Stones,” his second book about Mick and Keith and the boys. The following night Janovitz will do a reading at Newtonville Books. Add to the list his side gig composing music for “This Old House” and his actual “day job” running a real estate business in Lexington, and it sure sounds like a full-time load. “I have a lot of part-time jobs,” Janovitz says with a laugh when we catch up with him by phone from some rare vacation time with his family on the Cape. And Janovitz is committed to all of them, attests in-demand engineer and musician Ed Valauskas of Q Division studios in Somerville. This isn’t the singer-songwriter’s first crack at the Rolling Stones, having written an entry on “Exile on Main Street” in 2oo5 for the “33? ” book series about famous albums. But this time he had a larger canvas. He relished the opportunity to stretch (and geek out on minutiae in many chapters), to inject some humor, and to conduct interviews with Stones-related figures like producers Andy Johns and Chris Kimsey. “I wasn’t planning on doing another Stones book,” says Janovitz, who thought he might write something “closer to home,” perhaps about Buffalo Tom or something else semi-autobiographical, as he did with “Walt Whitman Mall,” a crackling, tuneful, roots-rocking affair that looks back at his coming of age on Long Island. 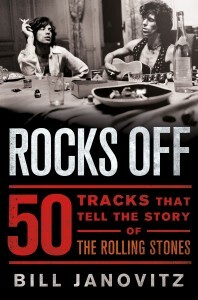 But when agent Kevin Pocklington reached out to him last year with the idea of hanging a book on 50 songs to coincide with the Stones’ 50th anniversary, Janovitz was hooked. Unlike other rock books, Janovitz didn’t go with a list of his “favorite” 50 or the 50 that were the most popular, meaning he sacrificed a few near and dear to his heart. Instead, he focused on the tunes that he felt, as the title says, best told the story of the band. But when he started to revisit those later records, to which he had only paid cursory attention at the time of their release, he was surprised at how many gems he found. Although he understands that readers might want to skip around to their favorites — “That’s probably the way I’d go about it,” he admits — because of the chronological setup, there is story within the list. Coincidentally, Janovitz met Richards shortly after he got the deal to write “Rocks Off” at an event at the John F. Kennedy Presidential Library and Museum last February. So he’s not worried that Jagger will call him up with a bone to pick? “Are you kidding? I would love to be slapped down by Mick Jagger,” he says, laughing. Publisher’s Weekly review is here. “You Can’t Always Get What You Want,” “Paint It Black,” “Satisfaction:” you know all the words but how much do you really know about the inspiration behind them? Or how their melodies were created? All artists reveal themselves through their work and the Rolling Stones are no different: each song exposes a little more of their soul. Rocks Off promises to reveal that soul by deconstructing their best tunes from their incredible fifty years of record making. Written by Stones fanatic, musician, and writer Bill Janovitz, this is a song-by-song chronicle that maps the landmarks of the band’s career while expanding upon their recording and personal history through insightful and energetic prose. With its conversational tone—much like friends pouring over old records on a Saturday afternoon—the book presents the musical leaps taken by the band and a discussion of how the lyrical content both reflected and influenced popular culture. The song choices—fifty in all—are chronological and subjective; most of them are the classic hits, however, the book digs deeper into beloved album tracks and songs with unique stories behind them. Looking through the prism of the Stone’s music in a fresh way, Rocks Off is the ultimate listening guide and thinking man’s companion that will spur readers to dust off those old albums and listen in with a new-found perspective on one of the most famous and acclaimed rock ‘n’ roll bands of all time. Expanding from his previous book about a single key album (Exile on Main Street, 2005), Buffalo Tom frontman Janovitz covers the Rolling Stones’ entire recording career. With all the hoopla surrounding the band’s 50th anniversary and the tour celebrating that milestone, a book about 50 significant Stones recordings could have practically written itself. But it wouldn’t have written itself nearly as well as Janovitz has; close listening and an ear for detail distinguish his analyses. By concentrating on the recordings—and not even albums as a whole, but specific tracks and singles—the author shifts the focus away from the band’s live performances and offstage notoriety, taking the spotlight off Mick Jagger to explore the crucial yet underacknowledged contributions of bassist Bill Wyman. Janovitz also demonstrates just how important Brian Jones was in the development of the band’s music and persona, while underscoring the subsequent virtuosity of Mick Taylor. As a musician, he highlights elements within the arrangements that might escape even a passionate fan. Yet Janovitz too is “an unabashed fan,” and his enthusiasm serves him well—though to describe “Jumping Jack Flash” at this late date as “one of their greatest songs…commanding and ballsy” would seem to belabor the obvious. The author experienced the music of the Stones’ glory days after the fact; when he gets to “Angie,” he notes that it was “the first Rolling Stones single I remember hearing contemporaneously,” which means that he can only imagine the immediacy and context of hearing the band’s musical progression as it unfolded. Nonetheless, his insights are shrewd and should inspire listeners to return to the recordings with fresh ears, recognizing that the Stones are more than Mick and Keith. Bill Janovitz explores the stories behind 50 Rolling Stones songs, from the raunchy “Brown Sugar” to the politically charged “Street Fighting Man,” in a book that will have you dusting off your LPs (or turning on your iPod) with a new appreciation for the iconic band. Read a sample and order the book here.